The Mellow Buzz. It’s got our Queens Courage gin, a chamomile-honey syrup, lemon juice and orange bitters. Some of the honey that I use comes from the Brooklyn Grange, and we make all the syrups in-house. This drink was actually one of the winning cocktails from New York Honey Week’s all-female competition, the Queen Bee. Astoria Distilling Co. mostly produces out of an upstate facility, but since Proof + Gauge is an offshoot, will any of the distillery’s gin be made here? We’d need a bigger facility for the gin itself, but we have a small test still, so we can do runs of interesting things and infusions. When I was a kid, my parents got me the Barbie Soda Shoppe instead of the Dreamhouse. They basically got me a bar, but I don’t think they realized it was going to go this far. A decade ago, I was transferring colleges and needed a job. I started working at a beach bar in Connecticut. [Management] tried to get me to work the margarita station in a bikini. I said that was not going to happen, but I could make drinks. 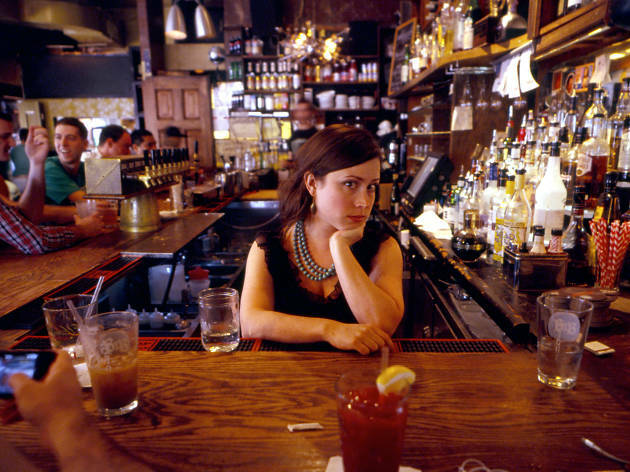 What was your first real NYC bartending gig? Sparrow Tavern, which is ridiculous because still work there six years later! A few weeks ago, we had a bunch of bartenders from the Penrose, Sweet Afton and the Bonnie hanging out and drinking. Some guys who were already drunk came in. They had a few drinks and then proceeded to leave without paying. All of our bartender friends ran out after them and confronted them. Eventually the cops showed up, and [the drunk guys] paid their check, but they didn’t tip!